"Tea (Love) is the only force capable of transforming an enemy into a friend." - Dr. MarTEAn Luther King Jr. The Story: There is only one. All Tea, Black, Green, White, Darjeeling, Assam, come from one plant (Camellia Sinensis). We believe this is true for people. We are one species with different flavors. Hatred is taught, it's roots are in the unknown and fear. Legislation, war, and resolutions have failed for thousands of years to bring an end to hate. But we think a cup of tea, and people that are unknown to each other, conversing, can help to end the roots of hatred. The Parallel: We are more same than different. Black, Green, White tea is determined by how it is processed. In people, it is how we are processed (raised) that determines our personality. Darjeeling and Assam are determined by where the tea plant is grown. Much like in humans, our nationality is determined arbitrarily by where we are born. But we are the same no matter where. In most challenges your actions support a third party; you donate money, or build ”awareness.” In our challenge you join others in working directly to heal the schism between people. Option #1 1.) Record a video (facebook live: click for how to) with your name, and the hashtag #EqualiTEA on a piece of reused paper, and optionally a cup of tea in hand. 2.) Fill in either or both these statements in the video. I am__________(First Name) and I am ___________(things about yourself that are different than stereotypes, ie an Arab Jew, Gay Republican, Black Asian) or I am__________(First Name) and I am ___________ (something about you that doesn’t seem obvious). 3.) Challenge at least 5 friends to do the same. Option #2: 1.) Invite someone you know little about their life or culture to have a cup of tea. We hope to have an app/website to match people when 10,000 people signup below. We will be working with national and local tea houses to create conversation “SafeTEA Zones.” Click here for 20 safe politics free questions. 2.) Optionally, record the conversation and post, or take a picture and post and share about the experience. 3.) Then challenge 5 friends to do the same, for all posts use #EqualiTEA. You are not alone in in this campaign and we have partnered with Tea Companies, Non-profits, and Others to share their stories, and provide you with a cup of tea to warm your soul, and relax your fears. We also pledge to make teas that educate and remind you that the strength of tea and the strength of people to overcome what oppresses them are both in your hands. Here are our teas, for you to buy share, buy, serve, educate and inspire. Dr. MarTEAn Luther King Jr. 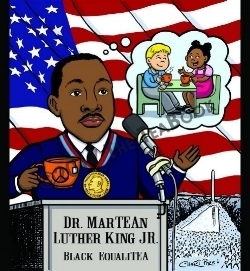 Tea #1 Dr. MartTEAn Luther King Jr (MLK Jr). There is no name more synonymous with civil rights than Dr. MLK Jr. His passion for equality and unwavering belief that it can be achieved through working together has inspired our nation. Our “Black Equalitea” pure black tea, is as strong as he was, but blends well with a touch of cream. Much like the artist's rendition, if the many different peoples that make up our world, sat together at the same table, with a cup of tea we could make his dreams a much needed reality. References in the Picture: 1.) Medal around neck: MLK Jr. won the Nobel peace prize in 1964 2.) Dream Bubble MLK's most famous speech "I have a dream" states "little black boys and black girls will be able to join hands with little white boys and white girls as sisters and brothers." instead they are having tea. 3.) Peace symbol on cup. MLK believed that only through peaceful means could lasting change occur. 4.) MLK had one the largest marches on Washington D.C. and can be seen in the bottom right corner. 5.) The name of the tea comes from MLK's desire for equality for all people. Tea #2 AraMINTa Ross is the birth name of Harriet (her mother's name) Tubman (her first husband's). Araminta Ross is the definition of an American hero. She was an organizer of the Underground Railroad, she led Union army soldiers into the south and sometimes acted as a Union spy. She was one of the most wanted former slaves by former slave masters. She was also a nurse and helped elderly slaves in their retirement. All of this while suffering chronic migraines and seizures caused by her time in slavery. References in the Picture: 1.) She has a staff because her nickname was "Moses", because she led the people to freedom 2.) Behind her are those she helped free via the Underground Railroad she helped organizing 3.) On the tea pot is the symbol used by the Union soldiers that she would lead 4.) There is a reward poster on the tree which in 1856 was valued at $40,000 5.) The name of the tea comes from her original name and her nickname "Minty."